Eleutherococcus senticosus is an adaptogen. An adaptogen helps support the body’s ability to adapt to mental and physical stresses, so helping maintain physical and mental stamina and well-being. Ingriedients: Eleuthero senticosus root powder, bulking agent (acacia gum). Add Sun Eleuthero to your daily regime to help support balance in your life. Start with four tablets per day and build up gradually to the recommended serving of 12 tablets per day. The easy to swallow tablets may be taken all at once or in smaller amounts as desired. Food supplements should not be used as a substitute for a vaired and balanced diet and healthy lifestyle. 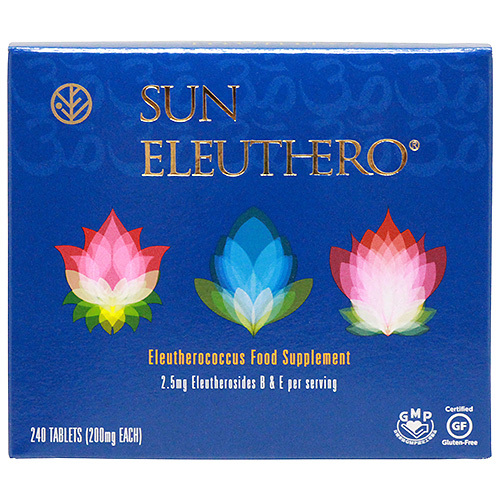 Below are reviews of Sun Eleuthero - 240 x 200mg Tablets by bodykind customers. If you have tried this product we'd love to hear what you think so please leave a review.